New themed tours!…plus the classics. 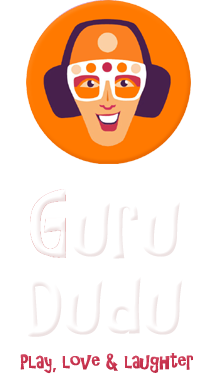 Guru Dudu is back at Brighton Fringe this year with his usual antics plus some new themed tours and some new tour guides. Tickets now on sale. All Sat 6pm tours during Fringe will have a 90’s theme led by Guru Dudu. Experience another flavour to the tours with our special guest tour guides who will be running some of the Sunday tours. They are trained by Guru Dudu with a similar set of values, bringing their own unique magic to the shows. All of the other tours will be run by Guru Dudu in his classic format of fun commentary and upbeat music from the 70’s, 80’s, 90’s and 00’s. Addional shows may also be added during the season. Check back here. Ticket also available at the start of the tours, if not sold out. All Tours start on New Road, by the Fringe Box Office. I found it to be the ultimate uplifting, liberating, out-of-body Fringe experience that everybody should try- and it keeps you fit too! It is also hilarious to watch even when you aren’t doing it. It was great to have you at Brighton Fringe; what you do really adds to the festival vibe. Plus some exciting news post-Fringe..
We now have an established team of tour guides who are based in London/Brighton area who are available throughout the year for private parties, Corporate and hens/stags events. Plus we will be running some ongoing public events throughout the warmer months. More info coming soon. We are also now recruiting new Tour Guides in the UK. Click here for info. SAFE DANCING Please be mindful of your personal safety and the safety of others while on the tour. The headphones decrease your ability to hear regular noises on the street. The headphones are also fitted with a volume switch so you can adjust the sound to an appropriate level for your safety and enjoyment. DISCLAIMER All tour attendees participating in a Silent Disco Walking Tour do so at their own risk and waive any liability claims against Guru Dudu Productions when they agree to join a Tour. This includes personal injury as well as loss, damage or theft to any walker’s property while they are participating in a tour. Any child under 12 years must be under supervision of an adult at all times.